Hopefully, the following information will help you enjoy the BOA Grand Nationals experience. This page is intended to be generic. Current information can be obtained from the Band Parents or your student (they usually know what's going on). If this is your first time at the Grand Nationals, you’re going to love it. From the time we get things started in July, through all of the practices, performances, and work to get the most out of a show, it all comes down to their performances this weekend. What is the Bands of America Grand Nationals? The BOA Grand National Championships is the largest and most prestigious national marching band event available to high school marching bands. It is a three-day, preliminary / semifinals / finals competition held at Lucas Oil Stadium in Indianapolis. Approximately 90 bands from across the country participate each year and it is attended by an estimated 50,000 spectators and participants. Participation in the competition is on a first come, first served basis up to the maximum number of bands established by BOA. There are no qualifying contests and all high school bands are eligible to participate. 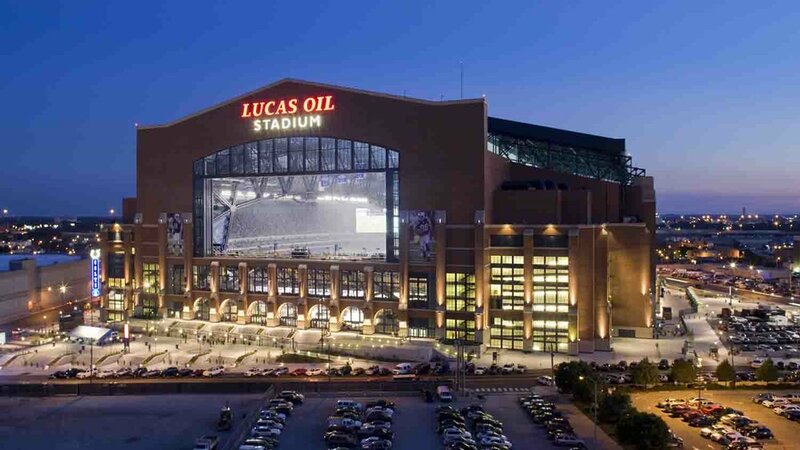 The Lebanon Marching Band will be staying at a hotel in the Greater Indianapolis Area. During the event the band members will have occasional free time when they can watch performances of other bands, buy some souvenirs, tour downtown, grab a bite to eat, or even take a nap. This is the best time to connect with your son or daughter. If you want to connect, ask your son or daughter to text or call you to set up a connection time and location. Keep in mind that "connect" does not mean spending time with your child or taking him or her out to lunch. But you may have the chance to chat for a few minutes to deliver souvenirs (or a few dollars for them to buy their own) or to see how things are going. Before the trip each band member will receive a detailed itinerary and guidelines for a successful trip. For scoring purposes, bands are classified by school enrollment, grades 10-12 only, in Classes A (smallest) through AAAA (largest). Lebanon is in Class AAA. Preliminaries: Half of the participating bands perform in one of the two separate preliminary contests held on Thursday and Friday. Each preliminary contest is balanced with like numbers of bands from each class. Lebanon usually performs on Thursday. Semifinals: Approximately thirty-five bands will advance to semifinals - the top 11 scoring bands from each day of the two prelims, regardless of class (22 bands) - plus - the next 8 highest scoring bands from the preliminary round (both days combined), regardless of class - plus - the 2 highest scoring bands from each class from each day of prelims, should they not already be among the first 30 bands selected on the basis of either criteria above. Bands advancing to semifinals and their performance times will be announced late Friday evening (usually around 10:00 pm). Semifinal performances will begin on Saturday morning around 8:00 am or earlier (in 2013 the first band performed at 6:45 am) and last until late Saturday afternoon. Finals: The top 12 scoring bands from semifinals, regardless of class, advance to Saturday evening's finals. Bands selected for finals will be announced around 5:00 pm Saturday at the Stadium and on the BOA Twitter feed. Class Champions (from semifinals) who are not selected for finals competition will perform in exhibition before the 12 bands selected for finals. Performance times will be determined during a meeting of the directors of the bands involved in the finals which is held immediately after the selections are announced. Preliminary and semifinal sessions are general admission (children 10 and under are admitted free for general admission). The Lebanon contingent (and there are many who attend) usually sit together to create a loud, boisterous cheering section. You may want your son or daughter to have souvenirs to remember their time at this event. If you pick something up for them, you may have time to connect with them during their free time. Your student should be able to give you a good idea what they want before the event. You can browse the merchandise here. Hotels in downtown will be pricey -- rates will drop as you get further outside of downtown. You need to reserve your rooms as early as possible -- some people reserve for the following year when the event is over. Future event dates are here.